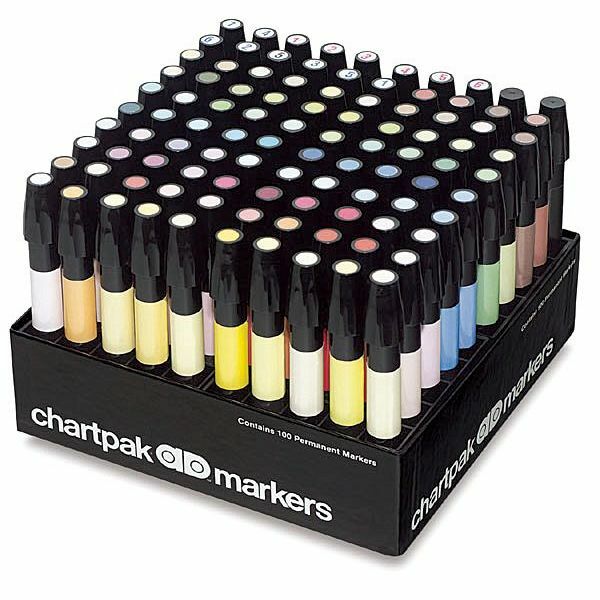 Chartpak® brings you its permanent color AD® Marker with three distinct line weights in one nib. Brilliant sparkling color delivered in fine point, medium weight or broad strokes with just a twist of the wrist. Enjoy 100pc assorted color AD Markers in this set. Set contains 100 colors: Apple Green, Aqua, Aquamarine, Banana, Basic Gray 5, Beige, Black, Blue Green, Blueberry, Blush, Brick Red, Bright Orchid, Buff, Burnt Sienna, Burnt Umber, Cadmium Orange, Cadmium Red, Cadmium Yellow, Celery, Chartreuse, Chrome Green, Chrome Orange, Cobalt Blue, Cool Gray 1, Cool Gray 2, Cool Gray 3, Cool Gray 4, Cool Gray 5, Cool Gray 6, Cool Gray 7, Cream, Dark Mint, Dark Olive, Dark Yellow, Deep Evergreen, Deep Magenta, Deep Salmon, Desert Tan, Dutch Blue, Electric Blue, Evergreen, Frost Blue, Goldenrod, Grass Green, Ice Blue, Kraft Brown, Leaf Green, Lemon Yellow, Life Red, Light Flesh, Light Sand, Lilac, Linden Green, Maize, Maroon, Mauve, Mint, Mocha, Naples Yellow, Navy Blue, Nile Green, Olive, Pale Cherry, Pale Flesh, Pale Indigo, Pale Lime, Pale Olive, Pale Yellow, Palm Green, Peach, Pink, Powder Pink, Process Blue, Prussian Blue, Purple Iris, Purple Sage, Redwood, Ruby, Salmon, Sand, Sapphire Blue, Scarlet, Sepia, Sky Blue, Sunset Pink, Suntan, Super Black, True Blue, Turquoise Green, Ultramarine, Violet Light, Warm Gray 1, Warm Gray 2, Warm Gray 3, Warm Gray 4, Warm Gray 5, Warm Gray 6, Willow Green, Wine Red, Yellow Green.